From the left side menu options, select Contacts > Segmentation. A pop-up will appear that gives you the option to start the segmentation either by choosing all contacts or selecting from specific lists. 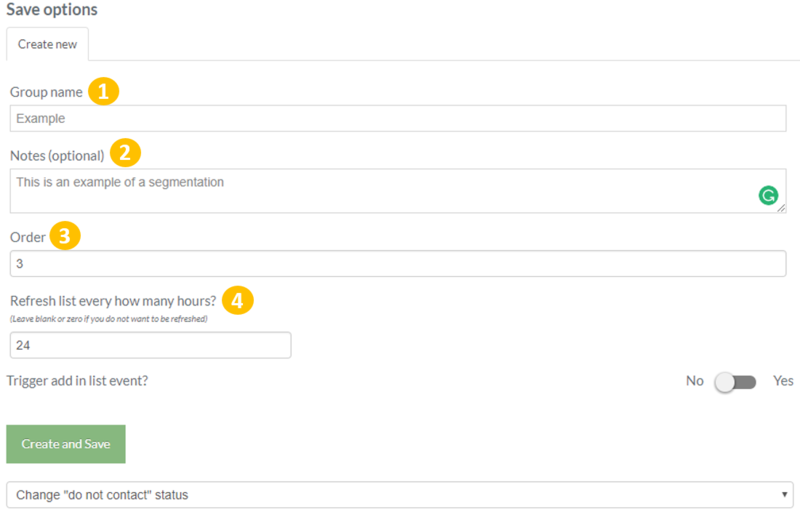 From the segmentation dashboard, you can select also negative lists that will be excluded from your segmentation in progress. Now, from the Conditions box, you can start creating your Segment by clicking on "Begin here". Let's see one example for each of the 5 types of segmentation. In this example, we'll see how we can create a segment with contacts that belong to a specific age group (i.e. 20-30 years old). From the first drop-down menu choose Contact info then Birthday then age based and then age from 20 age to 30. With the same process, you can create segments based on similar conditions such as First Name, zip code etc. In this example, we'll see how we can create a segment with contacts that haven't clicked on any link on any email sent the last week (7 days). From the first drop-down menu choose Email activity then They have not then clicked then any link then any email then through a time period then between 1 day(s) and 7 days ago. With the same process, you can create similar segments based on email activity with contacts that they have or haven't been sent, opened or clicked your emails within a specific time period. In this example, we'll create a segment with contacts that have added to their shopping cart at least one product that belongs to a shoes-related category (i.e. /shoes/, /shoes-boots/ etc.) the last 30 days. 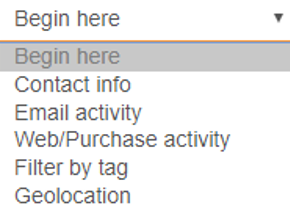 From the first drop-down menu choose Web/Purchase activity then They have then added a product in the cart then belongs to the category then that contains then write shoes then select within the last 30 days then write at least 1 time(s). Similarly, you can create other segments based on the behavior contacts have in your website/e-shop such as when they have or haven't visited a specific URL or when they have purchased a product. This is a more sophisticated way to segment your contacts. Tags are generally used to cluster your dataset based on a specific attribute that many of them share. It's also very helpful when you have an integration with a 3rd party software (i.e. CRM, ERP) and you want to use the additional information to enrich your segmentation criteria. In order to have such a segmentation in our platform, you should have a custom integration through API. There is also the choice of segmenting your contacts based on the location of their IP address. For example, you can create a segment with contacts living within a 20 km radius from the center of Athens. From the first drop-down menu choose Geolocation then write the last visit was from a location within a 20 km radius from Athens, Central Athens, Greece (Auto-fill from Google Maps). 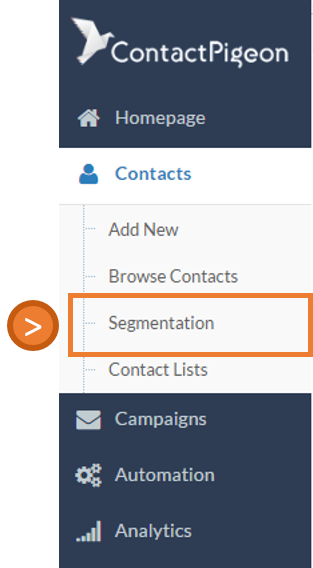 At any moment during your segment creation process, you can count the selected contacts based on your criteria and also review your segment's conditions from the sidebar. 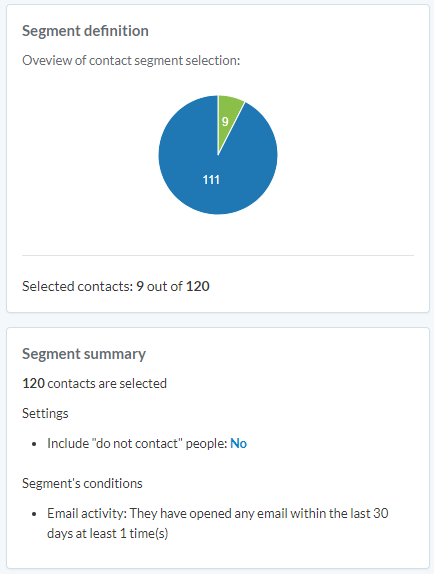 After you're done selecting and reviewing the conditions of your segment you can save the selected contacts in a list. 4. Select after how many hours the list will be refreshed with data from your site. By indicating an hourly refresh rate, the segment becomes dynamic as contacts will be added or removed from the list depending on whether if it meets the set conditions.